If MetroPCS didn’t win your wallet with their 2 lines of unlimited coverage for $80 or their new $40 6GB unlimited plan, it might be time to check them out again. 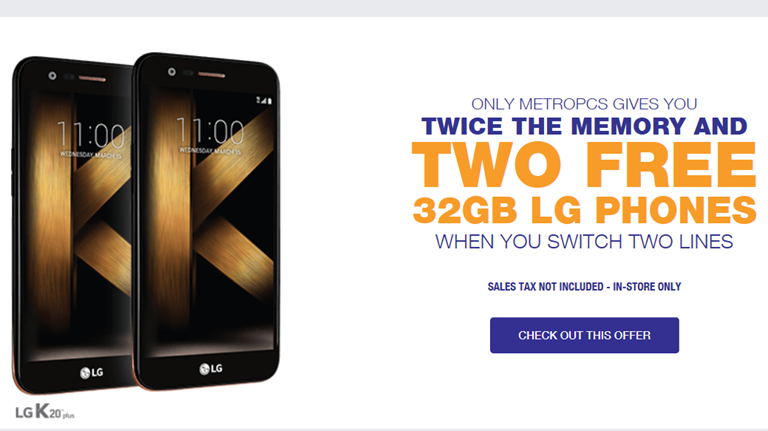 If you swing by your local MetroPCS store, you can score either the 2 line unlimited or 6GB deal and snag a few LG K20 plus handsets to boot. These $170 handsets are a bit closer to the mid-range level than what is typically offered for free by a prepaid carrier and that is a welcome sight. The K20 plus features a 5.3” HD display, a 2,700 mAh battery, a 13MP rear shooter/5MP front shooter, 2GB of RAM and 32GB of storage. It also features a Gorilla Glass 3 front panel and a rear mounted fingerprint center. Overall, the K20 Plus would be a great deal even having to pay $50-100 for the phone with a prepaid provider. If you’ve been thinking about jumping ship to MetroPCS, this could be one of the best deals you will see for a long time.